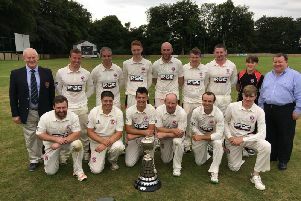 They are preparing to face Cliftonville Academy in the GMcG Chartered Accountants Junior Cup final at Moylena on Saturday (11am start) with the prospect of securing title number two on their way to a tremendous treble. Ready for the GMcG Men's Junior Cup final are, from left, Clarence Hiles (NCU president), Ross Bryans (Templepatrick), Andrew Magee (Cliftonville Academy) and Tony Nicholl (GMcG). Pic by PressEyeLtd. The Ballyclare side have also won nine from nine in Section Two, putting them joint top of the league with Saturday’s opposition. The Junior Cup was first played back in 1891, and captain Ross Bryans will be looking to lead the club to their first ever victory in the competition. “It’s the first time I’ve played in the final and it’s the first time a lot of our squad has played in it,” said Bryans. “We are really looking forward to it and we hope the weather holds up. “We are going for the treble at the minute. The Junior Cup and league is still to go, and we have won the Twenty20 Shield. With the new structure of leagues, Templepatrick are one of 15 teams in the division, and Bryans says there are various reasons for their fantastic form. “It’s been a lot of different things. “We signed two new players at the start of the season, then we had players coming back from abroad and university. It seems to be our year with things like that happening. “We have been able to retain most of our players and bring in a few more. This will be Bryans’ third season as captain, and at the age of 22 he remains one of the youngest leaders in the NCU. He says this season has been more straightforward than the previous two campaigns. “It’s been an easier season than I’ve had in the last two years. “I think with the way the league is structured at the minute, we haven’t really been challenged this year. 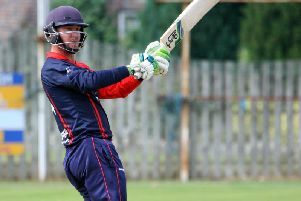 “We have been challenged only in the Irish National Cup, but other than that we have been beating teams by five wickets or 100 odd runs. The pair were meant to face off in the league last Saturday, but that was halted due to bad weather. A win this weekend will give the victorious team bragging rights and boost their confidence ahead of the title race, and Bryans is looking to get that extra edge. “It’s a slightly separate thing, but if we win on Saturday we will definitely be confident going into the league game, which will probably be one of the last games of the season now.